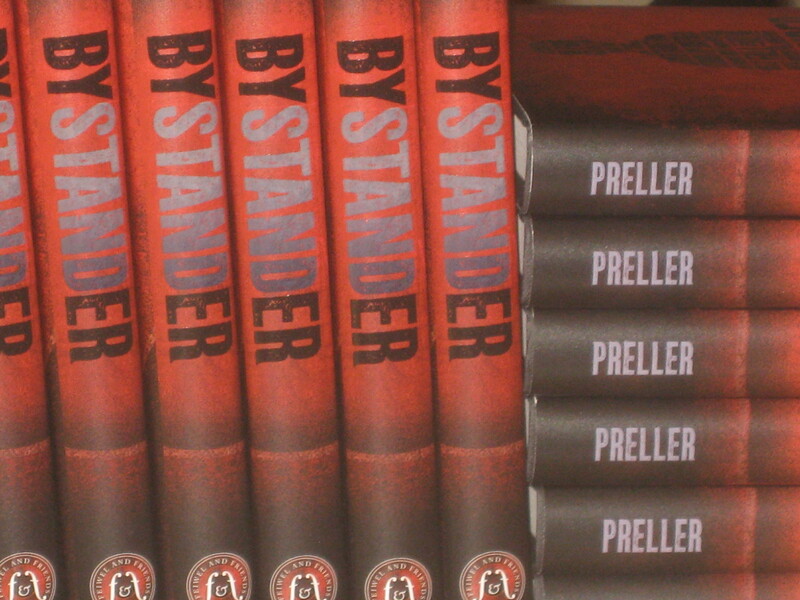 As I write this, my bully-themed novel, Bystander, is due out in stores tomorrow, the 29th. There seems no better time to share John’s story . . .
During my work on the book, I naturally reflected on my own experiences with bullying. Different incidents I’d encountered, large and small. I remembered a boy in 7th grade, who was in my Junior High homeroom. To ensure his privacy, I’ll call him John. John was teased a lot. He was short and unathletic. Defenseless, basically. In memory, going back through the gauze of thirty-five years, I remember John as an innocent, harmless kid. I felt sympathy for him. I tried to be nice to John: I wanted to be somebody who didn‘t pick on him. So I talked to John and, I sincerely hope, showed him some kindness. Now we fast-forward across more than three decades. Thanks to one of the popular social networking sites, I came across John’s name again. There he was. That same boy. So I wrote to him. You see, I thought of John many times as I wrote Bystander. He inspired me and, in some minor physical details, helped stand in for the book’s initial target, David Hallenback. I imagined John’s pain and his rage. To my knowledge, John was never punched, never pushed. Just teased. Ridiculed. An object of humor. I was stunned by John’s response. I’ve edited the following comments for the sake of brevity and anonymity, but otherwise won’t narrate much. John’s story speaks for itself. Wow, Jim, it’s been 34 years. Now that’s insane. I never would have thought you would remember me. Yes, I remember you, too. You were quite funny. I looked at your pictures and you look the same, a little older like all of us . . . Unfortunately, when I left Wantagh, I never looked back. I did not have pleasant memories of junior high. Being the sweet kid I was with curly hair which is straight now, unless I let it grow out. Many people that you may know or are friends with took advantage of my kindness both physically and mentally.
. . . that whole group was not very kind to me and really left a negative mark. If confronted today I would not be that sweet kid as you say. I don’t know but life goes on right. It’s been hard. I don’t wish what happened to me on any child or adult. In any case I am a lot stronger now and am not that easy going anymore. I would never let what occurred to happen again. I wrote back to John, shared more memories and my sense of regret and failure — if only as witness. I was the “nice” guy who stood by and did nothing. I guess they don’t give out prizes for that. I apologized to him as best as I could. The pain was still so raw inside John, the anger so real. One mention of junior high and it all rose screaming to the surface. John, thanks for your thoughtful, frank reply. I’ll be honest. I remember that. I remember how you were often treated unfairly. I think all of us have culpability, responsibility, for any bullying behaviors we witnessed. By doing nothing, we abdicated our responsibility, our humanity, and became just as guilty. Sometimes we fail to see how it feels for the victim; we lack empathy, compassion. I apologize for the hard times you had. I’m truly sorry. I hope that my memory is accurate, that I was kind to you. I always felt bad and tried to do the right thing, to treat you as the equal you always were. Thanks for reading this. And thanks, again, for writing to me with such heartfelt honesty. Thank you for your kind words and you are correct, you were always nice to me not like the others. And if I never mentioned it THANK YOU. It was nice to have a friend or someone who may have not said anything but did not add injury, hurt or insult. Anyway I would love to read your book and if I could help you or anyone else in the future please let me know. It’s amazing sometimes why things happen in life and why people are brought together. God works many miracles. Click here . . . or here . . . or here . . . or here. Pretty powerful posting. I think it presents a “chill” in all of us. Did I always do the right thing? To be honest, I am not sure. It would be very moving if you and “John” did a school visit to review the book and the experiences that shaped the text. very moving tale, Jimmy. It’s pretty remarkable how things that seem minor at the time can have such a powerful influence later on. This is really important stuff you’re addressing here, and I have a strong feeling you’re going to hit a big public nerve, in a valuable way, with this book. Looking forward to reading it. I’m on my third read through, thanks JP, for the light in novel form for the young, for all of us. Nan Hoekstra — a sighting! Great to hear from you, Nan, miss your bloggy blogness muchly. Thank you for the kind words. I don’t think even I read the book three times. Okay, more like thirty. Be still! Three times. Wow, I’m honored. Thanks for sharing this, Jim. I can quickly and easily think of several kids like John who experienced pain and humiliation on a regular basis during my school years. I can just as easily think of the many times I stood by and said nothing, or worse, joined in. To this day, I still cringe when I go back home and relive these memories. My ten and twenty year high school reunions have been marked, for me, by my feeble attempts at offering much-too-late apologies to some of my former classmates. My regrets shape the way I think as an adult and a parent. It is strange how life takes twists and turns; I am a middle school teacher today. I feel that one of the biggest (and best) parts of my job is to champion the underdog and to overtly teach for justice. I agree with Eric – this is so important and Bystander should hit a big public nerve. What a great quote, Matt, thanks for commenting. Honestly, I have no idea if this book will sell or not. I just hope it gets noticed. In a field dominated by women — by that I mean the teachers, the bloggers, the editors, the reviewers, the gatekeepers — it’s interesting that men seem to be the ones most responding to this topic. That is, a few seem to be stepping out of the woodwork. People ask me why we can’t get boys to read. Gee, hmmm . . . I will be teaching this book to my sixth grade class in January. I’m hoping that your very realistic characters will grab them the way that they grabbed me. I’d like to share this entry with them as well. Thank you! Thanks, Jenna. I hope they like it, too. My new motto is, “Stick up for the little guy — he’ll never forget you.” A hard concept for a 13-year-old, the long passage of time, but nonetheless true. Some of this stuff people will remember, and be affected by, for the rest of their lives. That’s what killed me about John’s note: 35 years later, and still so raw.